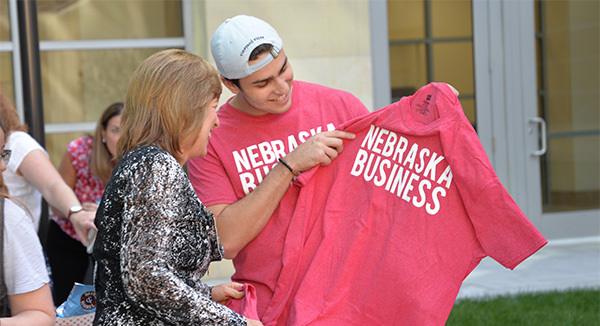 Dean Kathy Farrell checking out Nebraska Business T-shirts at the Traditions Tailgate. Social Media Photo Booth – Monday, September 17, 10 a.m.-1 p.m. in HLH 231. Students can pose for a free professional headshot to use for their social media accounts. Student Organization Fair – Tuesday, September 18, 10 a.m.-1 p.m., Henrickson Family Atrium. Students can discover student organizations to join and get involved. Traditions Tailgate – Wednesday, September 19, 11 a.m.-1 p.m., Lower Level Courtyard. Alumni, faculty, staff and students can stop by the Traditions Tailgate where there will be games, music and food, served on a first-come, first-serve basis. Global Immersion Fair – Wednesday, September 19, 10 a.m.-1:30 p.m., Henrickson Family Atrium. Learn more about the study abroad programs offered in the college. Nebraska Business Breakfast – Thursday, September 20, 8:30-10:30 a.m., Henrickson Family Atrium. The Nebraska Business community are invited to enjoy pancakes over conversation. Pancakes will be served on a first-come, first-serve basis. Students can receive a free professional headshot on Monday, September 17 in HLH 231. With help from the Academic Leadership Association as an external facilitator, Dr. Kathy Farrell, James Jr. and Susan Stuart Endowed Dean of the College of Business, along with nearly 50 other various faculty, staff, students, alumni, business partners and university representatives gathered this spring to figure out a way to achieve the next level of excellence for the college. The strategic planning process, mission statement and guiding principles will be displayed in the Henrickson Family Atrium during B-Week to view, along with postcards available to take with the mission statement and guiding principles featured on them. “We feel B-Week is an important tradition as it is a way to celebrate the study of business, the hard work of our students and to recognize the contributions faculty and staff make towards our academic and professional pursuits,” said Schnacker. To view the schedule online and learn which events feature free giveaways, visit: https://business.unl.edu/bweek.